We have been making sock monsters this week and then I suddenly had the idea to make these little fellows. All you need is a worn out kids sock and a cone. 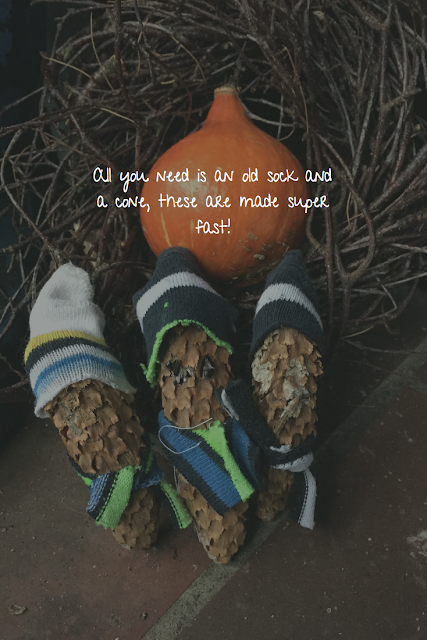 If you use a big pine cone you might need a grown up sock. You need to cut the cap of a sock and then half it. Turn it inside out and sew the long side closed. Turn it back right side out and pull it over the cone. Cut another straight piece of the sock, thick enough that it fits as a scarf for the size of cone you use. In our case it was roughly a centimetre. Cut the loop open and tie it around the cone. If you want to you can use a permanent marker to make hime two eyes. Tada, you are done. See how fast this was? If you have an old red sock you could easily turn this into a Santa with some added cotton wool for a beard. LOL, Thanks for stopping by Jinzo! Hey Jinzo, I was actually thinking of the two of you! How are you and the cheetah? 24h per day are just not enough at the moment to bring all my ideas here, but I hope I will be back some time as I miss this spot! Please give the Cheetah some gentle chin scritches from me. The cheetah and I still reviewing a lot of fun movies,I did Thanksgiving this year and the cheetah killed his second mouse. Winter is trying to impose its way here but no serious snow as of yet. The cheetah and I are missing you! !